It’s that time of year again! Across the Northern Hemisphere, some plant species are all decked out in red, yellow, or orange in preparation for freezing winter temperatures. Known as “deciduous,” these plants time the dropping of their leaves with low temperatures and less intense sunlight. Once a deciduous plant gets its cue, its leaves stop harnessing the sun’s radiation, a vital ingredient the plant uses in photosynthesis. As the green pigments responsible for absorbing sunlight called chlorophyll breaks down, the green leaf color fades. What’s left are reds, yellows, oranges, and sometimes even purples! These stunning colors are present year round but are masked by the high density of green chlorophyll. While gusts of wind can dislodge the now-dead leaves, the plant will actively sever the bond between the leaf and the stem. This ensures that the plant isn’t funneling nutrients into a dead leaf! The tree then goes dormant, stopping any growth and feeding off its stored carbohydrates until warm temperatures signal the tree to grow new, green leaves. 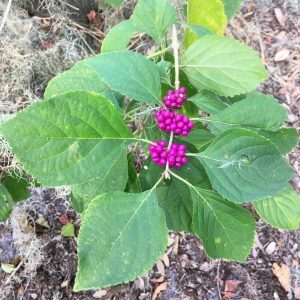 Many parts of Florida do not get cold enough to grow deciduous plants. However, we have a handful of species that show off their fall foliage if you know where to look. 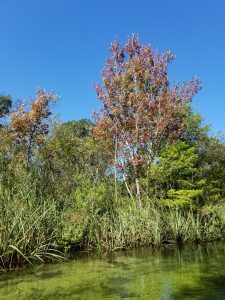 Swamp-dwelling red maple and cypress trees reveal rusty reds. In higher and drier locations, Virginia creeper and elm species can be found with yellow and red pigmentation. 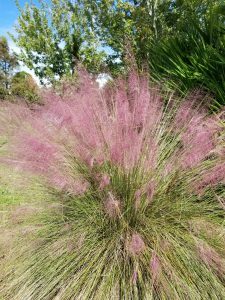 Purple is rarely seen on leaves, but can be found in the autumn blooms of muhly grass flowers and the berries of American beauty berry. Wherever you are in Florida, the best way to find fall foliage is to get outside and explore! If a trip north for a leaf-peeping trip is in your future, you can use technology like the Great Smoky Mountain’s Fall Foliage Prediction Map to time your trip with the most vibrant of autumn colors.